At FL370 cruise and for some reason my Cabin Pressure ECAM is showing a very high delta P due to a cabin altitude of -150. Any idea what might be causing this? I don't recall having seen this behavior before. Never seen that before. Does it happen again? Not happening today. I'm at FL 360 cruise showing a normal 7000 foot cabin altitude with 8.0 delta P. Naturally I'll keep an eye on it. For what it's worth, for the problem flight I had made a packs off takeoff using FS2Crew. I'm not sure if that had anything to do with it or if it was messed up before I even pushed back. 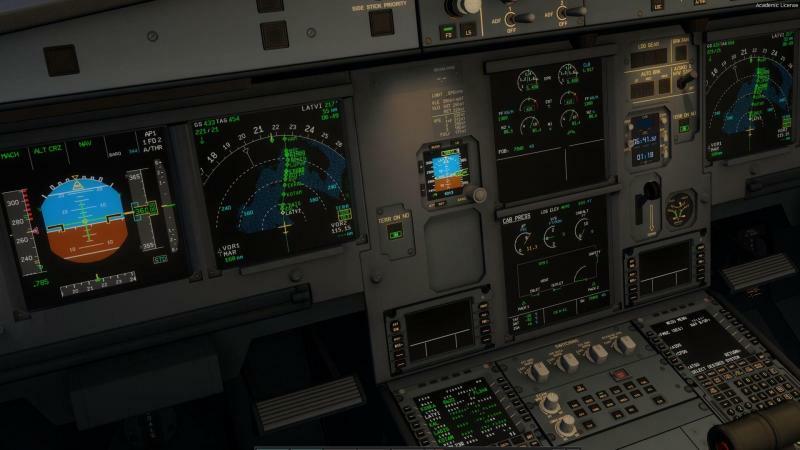 Per Virtual Airline SOP, I typically perform packs off takeoffs - if that did cause the problem, that has been the only time across several different flights where that has happened. 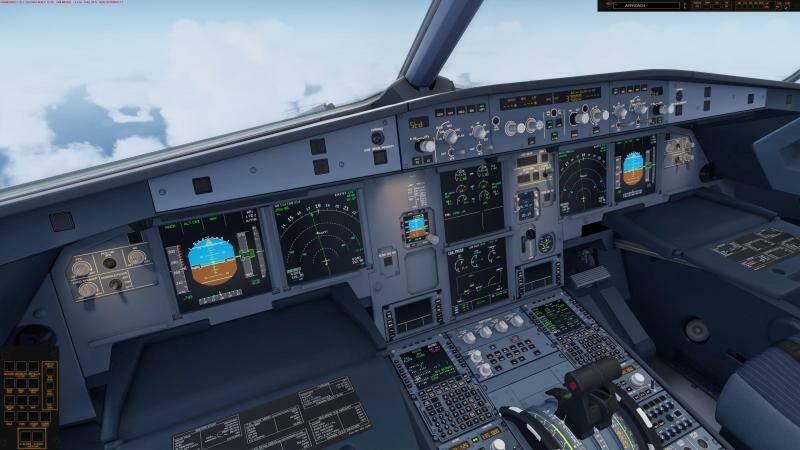 A321-231 IAE 1.2.2.1, P3D 4.3, real weather by AS. Since the section "cabin pressure" at the OH is not simulated, I have had to choose a lower FL. I'll ask Frank to look at this. Thank you very much, Mathijs! I had the same problem, showing delta P 11.1 and cabin altitude -200. For myself it did happen only on one flight. Maybe a computer has got headace sometimes too?! I did many flights last months and it happened only once. So I think, it is not as important as some other issues. Nevertheless thank you for looking after! I had this happen. This is with the current Experimental version 1.2.2.2. I am not stating this to be like hey fix this now. I just wanted to bring it to your attention. 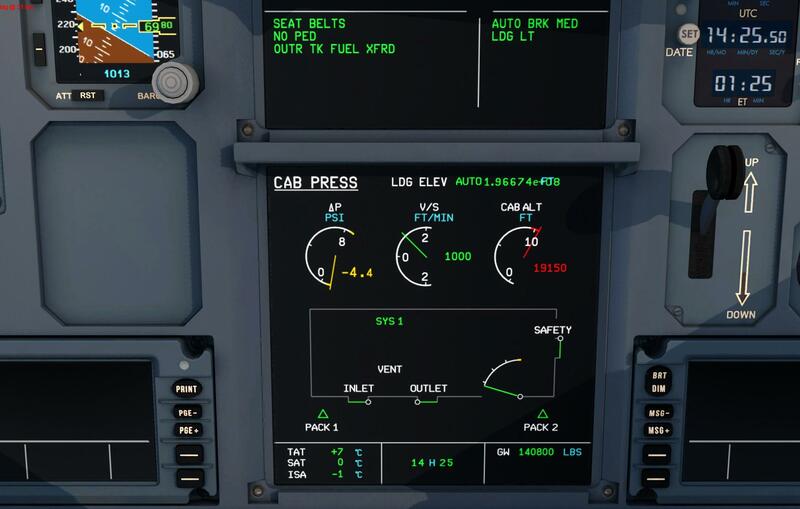 When I finally got near the ground the cab alt was at like 27K Feet. 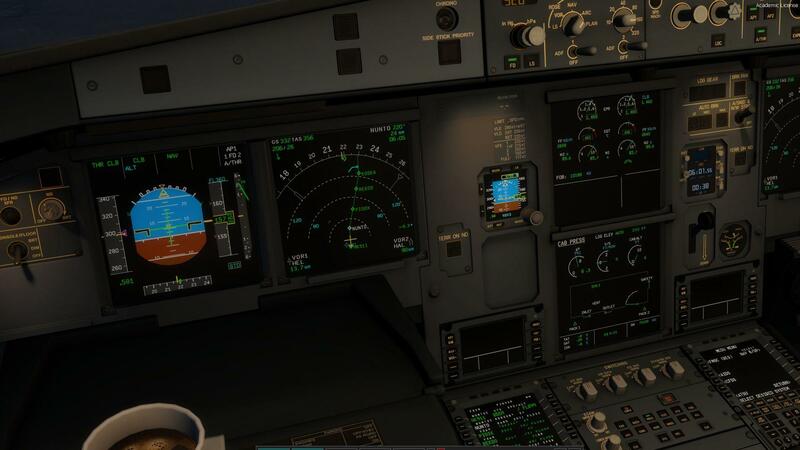 My cruise alt was only FL230 for this short hop from EGLL to EHAM. We are still trying to find a way to reproduce this issue with our testers. So far we haven't had any luck so it's very hard to say what could be causing this yet alone how it could be fixed. Any help on how we could possibly reproduce this issue as well as log files are always appreciated. Oh it's very easy to reproduce. Just got to a high ALT stay there for a while and then descent with a higher rate that 300 ft/min. Had the exact same issue on my third total flight (done today). Up to date product, only ActiveSky, FSUIPC, 737 NGX, MJC Q400 and ORBX addons installed, on a two month old clean v4.3-install. I have completed multiple flights with no cabin pressure issues. Same thing with other testers and multiple users (otherwise this thread would have exploded already if everyone faced it). We know that some users are facing issues with this and are trying to find a way to reproduce it so we know what's actually going on to fix it. As with Tim's picture, I can see that there are some other issues that became present with 1.2.2.2 update. Can you guys who are now experiencing this issue confirm what version you are using as well to rule out that it's 1.2.2.2 issue you are experiencing. I know people experienced this before the update, but there might be two issues now happening with it. One which is connected to 1.2.2.2 and one which isn't. Sounds confusing but trust me it helps a lot if you can report the Airbus version number as well when reporting about this issue. I notice if I start my flight from saved situation, there is sometimes wrong readings in cabin pressure. Never if I choose cold & dark or turn around state. 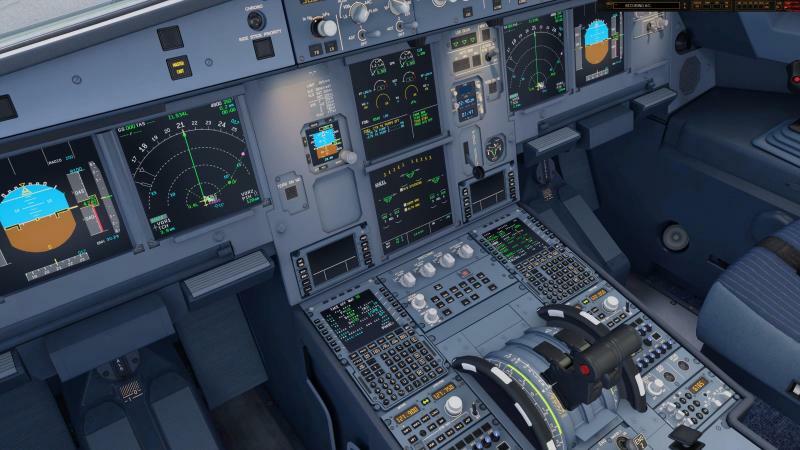 Had the issue before updating: A321-231 IAE 1.2.2.1, P3D 4.3, real weather by AS. ﻿ Meantimes I have had the problem three times. Just had a recurrence of the issue tonight, first time in 14 flights (original post). Logs attached! Not sure if it was related, but I had a few other odd things happen after landing; most notably a center fuel tank ECAM message after I had shut down both engines (block was 17.63 klbs so the center tank was not at all utilized during the entire flight). Maybe something just failed to initialize correctly upon load. Well I take it back! Could you please try version 1.2.3.0 and let us know if you still have this issue. 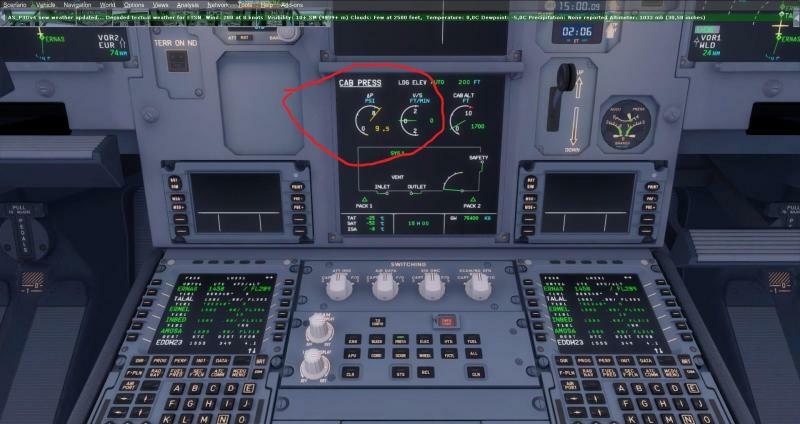 Also, if you get this issue on the new version, please tell us a bit on what stage of the flight it happens and what altitude you are flying at. 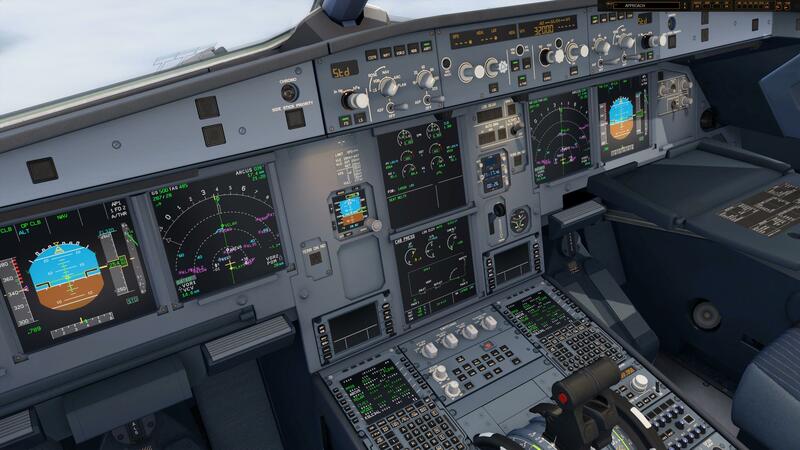 I selected Airbus 321 and got normal indication. Seems to be solved with the last update! Thanks for the reports AAC47 & tigran90241. I will keep this thread open for a little while still to see if anyone is still experiencing this issue on version 1.2.3.0.